Deal of the Day….. What is it? As you may have guessed from the name, it’s an item offered for an incredible deal on GunBroker.com, available for a limited time or until the item offered sells out. How can these deals be so good? We have partnered with OutdoorLiquidators.com, LLC, a company that provides eCommerce services to companies. They work with manufacturers, distributors, importers, and retailers to list products at incredibly low prices so they sell fast. While they specialize in hunting and shooting merchandise they will gladly utilize their expertise to sell other outdoor and sporting good merchandise. I bought a Deal of the Day. Where can I find a record of the transaction? Just like any other item purchased on GunBroker.com once the Deal of the Day is purchased, the item will appear in your MyGunBroker section, under GunBroker > Buying > Won. 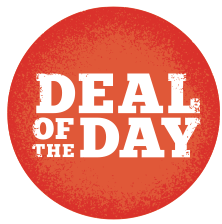 How do I pay for my Deal of the Day Item? Once you purchase the item, you will be automatically taken to Checkout where you can submit payment securely using the GunBroker.com Checkout system. No. Once a deal expires or sells out, the item offered is no longer available for purchase. I just clicked on the “Buy Now” button, but it now says “Sold Out”. Why? Deals end quickly. Some deals may only last hours or minutes before the item offered sells out. If you are interested in an item offered, it is important you make the purchase quickly. How can I increase my chances of getting a Deal of the Day before it sells out? You can also check the GunBroker site frequently to see if a new Deal of the Day has come up for sale by tapping Deals in the header menu. Subscribe to the Deal of the Day emails and find out about DEALS before the rest of the planet!!!!! I didn’t mean to order the Deal of the Day. How do I cancel my order? How can I get my merchandise to be sold as a Deal of the Day? If you have inventory you are tired of looking at, or know there is “stuff” in the warehouse which needs to be identified and sold, Outdoor Liquidators will sell it for you. They can move new or used, aged or obsolete, discontinued, over-stock, “scratch and dent”, “damaged and in need of repair”, returns, or generally forgotten merchandise. OutdoorLiquidators.com can do all of the work, from identifying the item to listing and selling it online, collecting payment, and packing and shipping it. They do all of the work for you. Contact them to learn more.